The secret key to the success of Star Wars in 1977 was its fully realized world. Its universe felt old, lived-in, with a wide diversity of alien species who spoke their own languages. Most of the non-English languages heard in Star Wars aren't fully realized linguistic creations like Elvish from Lord of the Rings or even Klingon in Star Trek. But some languages used in George Lucas' saga were fully or partly based on real-life languages and dialects. Here are some of the languages that fans in Central America, Africa, the Himalayas, and Scandinavia might already have noticed. Probably the richest language in the saga, Huttese is reserved for baddies like Jabba the Hutt and his cronies. Legendary sound designer Ben Burtt based Huttese on Quechua, a native Peruvian language spoken in the Andes region of South America. 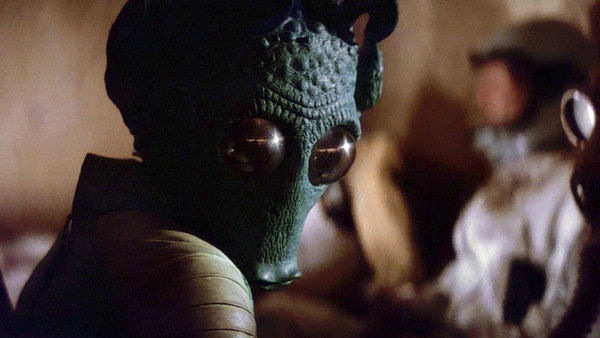 Huttese isn't fully Quechua, as Burtt simply had voice actor Larry Ward listen to recordings of the real-life language to improvise an on-screen language for Jabba and characters like Greedo to speak. When I talked to Howard Tsai, a lecturer of South American Anthropology and coordinator for the Indigenous Languages program at the Center for Latin American & Caribbean Studies at the University of Michigan, he said he'd heard about the language's inclusion in the movie. "It seems like languages are quite difficult to generate without sounding like gibberish, which speaks to the complexity and systemic nature of human language," he said. "And we're able to detect that complexity as soon as we hear something that doesn't resemble real grammar or syntax." Tsai also admitted Quechua was used most likely because it seemed obscure, which he pointed out is not the case. "Quechua is the most widely spoken indigenous language of the Americas, spoken by some 8.5 to 10 million people," he said. "It's a living language that has evolved and changed through time, so modern spoken Quechua is not 'ancient;' it's as recent and contemporary as the English we speak." So any Star Wars fans with good ears visiting Cuzco might pick up on some Huttese as well. Any Tanzanian fans of Return of the Jedi probably have a favorite character in Nien Nunb, the co-pilot of the Millennium Falcon that helps Lando Calrissian blow up the second Death Star, who spoke the language of the Haya people native to the east African country. It's called Sullustese in the Star Wars universe. Both characters from The Phantom Menace are technically two different species altogether -- Watto is a Toydarian and Sebulba is a Dug -- but they both manage to speak a little Finnish in the much-maligned prequel. In an exchange during the podrace sequence, Watto exclaims, "Kiitos!" The sniveling podracer Sebulba then answers back, "Ole hyvä!" This must have puzzled Finns, as the aliens just said, "Thank you" and "You're welcome" in the Nordic language. That banter even extends beyond the movies, as a 1997 Star Wars video game called Masters of the Teräs Käsi translated to "Masters of the Steel Hand" in Finnish. Ilmari Ivaska, a lecturer in the Department of the Scandinavian Studies at the University of Washington, told me this isn't the first time Finnish has snuck its way into pop culture." J.R.R. Tolkien studied Finnish and used it as an inspiration when creating the Elvish languages," he told me. "It's an exemplary case for real languages influencing artificial ones in art." But why would the filmmakers want to drop it into Star Wars? "You would want a language that has a relatively small native speaker community and that would still be documented well enough to have accessible resources and grammatical and lexical descriptions," Ivaska said. "Finnish all of a sudden is not such a bad bet." Helena Halmari, a professor of English and the editor-in-chief of the Journal of Finnish Studies at Sam Houston State University agreed. "Finnish has an extremely rich inflectional system," she said. "Its vowel count within words is also very high in proportion to the number of consonants, which makes its phonological quality different from languages that are richer in consonants." She added that she hoped its inclusion in Star Wars could get people interested in learning more about the language. Otherwise, she said, "I've met young people who have started to study Finnish just because of their interest in Finnish heavy metal bands." While the actual language of the bug creatures from Attack of the Clones isn't technically word-for-word based on a real-life language (sound editor Matthew Wood invented it from recordings of penguin mating calls), the clicks they use to speak are at least familiar to scholars of southern African languages and dialects. Xhosa, one of the 11 official languages of South Africa, spoken by an estimated 8.1 million people, is memorable for its consonants being expressed via clicking sounds. In fact, the "X" in Xhosa is pronounced using a click. "Although click sounds are found in only a small number of languages, mostly concentrated in Southern Africa, other languages -- including English -- also use clicks," explained Andries Coetzee, an associate professor of linguistics at the University of Michigan and a native South African. "English, for instance, uses the 'lateral click,' which is formed with the tongue pushed sideways against the inside of the teeth on one side of the mouth, to either indicate disapproval or to encourage a horse to start moving. It's often transcribed as 'tsk-tsk.'" He continued: "In Xhosa and other Southern African languages, however, these clicks are used as real consonants." Similar to his work on Quechua, Burtt was inspired to create the language of the sentient teddy bears called Ewoks in Return of the Jedi after watching a BBC documentary about Tibetan, Nepali, and Kalmyk languages spoken in Asia. He later interviewed native speakers and played it back) to the Ewok voice actors to phonetically capture the style of the language for the little creatures who helped defeat the Empire on Endor.